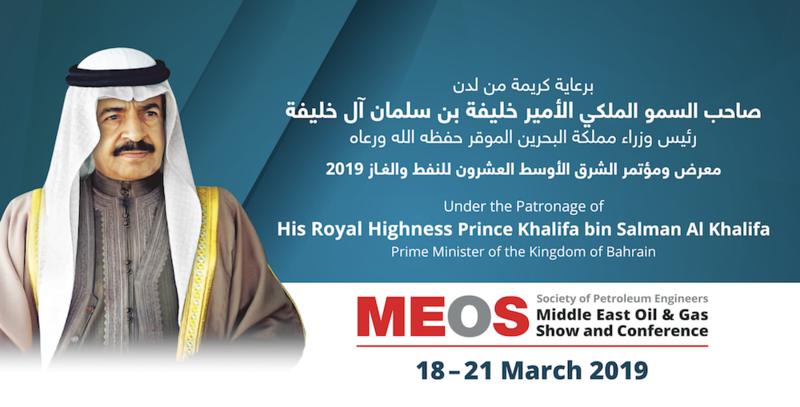 On the evening of Monday, March 18, 2019, the 21st edition of the Middle East Oil and Gas Show and Conference (MEOS 2019) has been inaugurated, hosted by the Kingdom of Bahrain under the patronage of H.R.H. Prince Khalifa bin Salman Al Khalifa, the Prime Minister. Under the theme "Resilience through Talent and Technology Transformation" at the Bahrain International Exhibition and Convention Centre, organized by the Society of Petroleum Engineers (SPE) and the Arab Exhibitions Management company, with cooperation with the National Oil and Gas Authority (NOGA) and with the support from a number of regional and international oil companies. H.E. Shaikh Mohammed bin Khalifa Al Khalifa, Minister of Oil, expressed his sincere thanks and appreciation to H.R.H. the Prime Minister for patronizing this important event since its inception in 1979. It reflects the keenness of the government of the Kingdom of Bahrain to provide the utmost to support and assist in this kind of specialized activities that benefit the economic, cognitive and development system and the principle of exchanging information, experience and expertise and participate in the building of capacity and skills, as well as the skills and expertise of the human element which is an essential to the sustainable development process. H.E. the Minister of Oil stressed that MEOS is one of the most prominent activities in the field of oil and exploration in the Middle East region. Where most of the international and regional oil companies are keen to participate in this important event to take advantage of the papers presented and discussed during the sessions of the conference by experts, global speakers and executives in the oil and gas sector from various countries around the world. As there is an opportunity provided by the accompanying exhibition to look closely at the latest advanced technologies in the field of oil and gas and exploration technology and production. The conference will include 6 discussion sessions with the participation of a distinguished group of international speakers from Gulf and international oil and industrial companies to discuss the most important issues and the most important of these topics: Resilience of the Future—How Can We Achieve Resilience in the Coming Years?, oil prices and future outlook, what have we learned?, the value of technology and business impact, the fourth industrial revolution, the growth of the next generation of industry leaders, unconventional resources beyond innovation and technology: partnerships towards success and other important related subjects. Also, the conference will include 50 technical sessions and will offer 200 different topics related to oil and gas. The accompanying exhibition is expected to attract more than 5,000 participants and over 200 companies from national, regional and international oil, gas, refining and petrochemical companies from Australia, Canada, China, Brazil, Denmark, Kingdom of Saudi Arabia, Kuwait, United States of America, Turkey, Russia, Malaysia and other countries of the world. It should be noted that MEOS is held periodically every two years under the patronage of H.R.H. Prince Khalifa bin Salman Al Khalifa, the Prime Minister, aiming to take advantage of the opportunities available in the countries of the region and increase the demand for the use of modern technology to raise the level of efficiency and performance in the oil, gas and petrochemicals sectors. MEOS have contributed in providing the best modern oil and exploration intentions that have affected the sector in the Middle East and the Gulf region.